Mini-DH is a deuterium tungsten halogen light source optimized for fiber optic coupling. Light source functions can be controlled by the spectrometer. The deuterium and tungsten lamps can be operated individually or together. 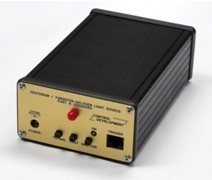 This is an ideal light source for transmission measurements. The Mini-DH has an integrated TTL shutter that facilitates the taking of dark background spectra.